Superconductors, broadly speaking, can be divided into two classes by how its electrons bind together to form the “Cooper pairs” that sustain dissipation-less current flow. The first class of “conventional” superconductors contains all of the metallic superconductors, such as mercury, lead, or niobium. Here the attractive potential, or pairing symmetry (represented by a circle in Fig. 1a), of the Cooper pair is equally strong for all electrons, and transition temperature Tc at which superconductivity emerges is limited to at most 30 K, only one tenth of room temperature. The second class of “unconventional”, or extraordinary, superconductors behave much differently – and strikingly can possess transition temperatures in excess of 150 K, half of room temperature. 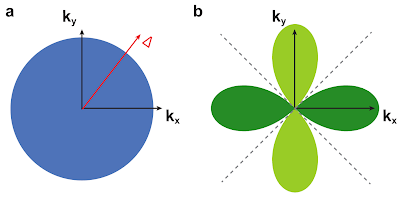 The pairing potential (represented by a four-leaf clover in Fig. 1b) now depends sensitively on the direction of the electron’s momentum, with certain directions (called nodes) having zero pairing strength. Fig.1 a) Representation of the pairing symmetry of a conventional superconductor by a circle. The paring amplitude is isotropic in direction. b) Representation of the pairing symmetry for an unconventional (dx2-y2) superconductor by a clover shape. The pairing amplitude is zero for certain directions called the nodes, depicted by the dashed lines. Heavy fermion materials, whose electrons behave as if they have greatly enhanced mass due to strong interactions between them, belong to this unconventional class of superconductors that also includes the widely known high-Tc copper-oxide “cuprate” superconductors. Intense research effort has determined the pairing symmetry of the cuprate superconductors to be of dx2-y2 form (clover leaves separated by nodes occurring diagonal to the axis); however, an understanding of its mechanism and the precise cause of their high transition temperatures remain elusive . Heavy fermions, such as CeCoIn5, have been suggested to share the same paring symmetry, and thus possibly the same underlying mechanism, as the cuprate superconductors . Nevertheless, the superconducting phase of heavy fermions has largely dodged the same intense experimental spotlight, as their low transition temperatures preclude access by conventional experimental tools such as photoemission (ARPES) and, until recently, scanning tunneling microscopy (STM) [3, 4]. To probe superconductivity in the prototypical heavy fermion CeCoIn5, synthesized by our collaborators at Los Alamos National Laboratory, we developed a new state-of-the-art STM operating at dilution-fridge temperature and high magnetic field. Like the high-Tc cuprates, superconductivity in CeCoIn5 emerges in close proximity to an anti-ferromagnetic critical point and out of a normal state showing strong non-Fermi liquid behavior . Accordingly, angle-resolved thermal transport and neutron scattering experiments [6, 7] have shown data consistent with a dx2-y2 gap symmetry; however, until our experiment, no phase sensitive identification has been performed. Unlike the high-Tc cuprates and more favorable to experiment, unconventional superconductivity occurs in the undoped, and thus ultra-clean, sample of CeCoIn5 and can be extinguished here by an experimentally-accessible magnetic field (5 T perpendicular to the c-axis). STM can probe the pairing symmetry of an unconventional superconductor through two ways: 1) studying the surface electron waves caused by the interference of quasiparticles scattering off impurities, or 2) studying the bound state formed by a pair-breaking impurity. Our research is the first to perform this comprehensive set of experiments on superconducting CeCoIn5, reaching a temperature of 245 mK, well below CeCoIn5’s Tc of 2.3 K. To isolate the salient effects of superconductivity, we in fact conducted each experiment first at zero magnetic field, where superconductivity is strongest, and then repeated each experiment again at 5.7 T, where superconductivity is extinguished. The quasi-particle interference (QPI) patterns reveal heavy bands (m* ~ 25 m0) in the normal state that rapidly close within ~10 mV above the Fermi level (see Fig. 2). These heavy bands develop significant changes with the onset of superconductivity; however, the particular fashion in which these changes occur in our data cannot be explained by the simplest (electron-hole symmetric) model of QPI that has previously been applied to the cuprate superconductors. This is unsurprising because the Fermi surface of CeCoIn5 possesses multiple bands with complicated shapes, in contrast to the typical single circular hole barrel of the cuprate Fermi surface. Consequently, conclusions drawn from the superconducting QPI would require a large number of assumptions that cannot be independently justified. Fig. 2 a) Electron waves formed by the interference of heavy electrons on the surface of CeCoIn5. b) The discrete Fourier transform of the real space conductance map in a) gives information on the wavelength and direction of the waves seen in the image. By performing these measurements as a function of energy, we determine the relation between energy and momentum of the heavy electrons that pair together to produce superconductivity, showing them to behave with effective masses up to 30 times the bare electron mass. While the QPI in CeCoIn5 could not provide an unambiguous result, the spatial distribution of an impurity bound state fortuitously revealed a direct nanoscale fingerprint of the superconducting gap symmetry. Excitations in a superconductor are so called Boguliubov quasiparticles, which are mixtures of electrons and holes in the Fermi sea. The spectrum in Fig 3a, with enhancement at positive bias, shows an impurity attractive to the electron part of the Boguliubov quasiparticle. This electron-like component leaks out away from the impurity along the minima of pairing potential, thereby pinpointing the nodes to occur at diagonal to the crystal axis in dx2-y2 form [8,9]. We can further confirm the identity of this signal by imaging the hole component of the same impurity state, showing it to be spatially complementary to the electron component as is expected for superconducting pairing. As a final check of its superconducting origin, this bound state disappears when superconductivity is extinguished. Fig. 3 An impurity in an unconventional superconductor locally disturbs the Cooper pairs of the electron sea. In a), we determine that this particular impurity attracts the electron component of the Cooper pair as its spectrum shows an enhancement at positive energies relative to the spectrum far away from it. The characteristic energy-dependent spatial patterns of how this impurity locally perturbs superconductivity (shown for negative and positive energy in b) and c), respectively) directly reveal the symmetry of unconventional Cooper pairing in this compound. Our research on CeCoIn5 firmly establish its pairing symmetry to parallel that of the high-Tc cuprate superconductors and extend for the first time the power of the STM to another class of extraordinary superconductors, the heavy fermions. In fact, the parallel to the high-Tc goes even further: our spectroscopy reveals superconductivity to develop within a depression of the density of states near the Fermi level that persists above Tc and above the critical magnetic field. Could this gap have a similar origin as the peculiar normal state “pseudogap” in the cuprates? Most importantly, the ability to study CeCoIn5 broadens the experimental tool-kit for tackling the questions of unconventional superconductivity – what role of magnetism, other competing phases, and electron-electron interaction in the normal state play in making these special superconductors the most robust of the bunch. C.C Tsuei, J.R. Kirtley, "Pairing symmetry in cuprate superconductors". Review of Modern Physics, 72, 969-1016 (2000). Abstract. Joe D. Thompson and Zachary Fisk. "Progress in Heavy-Fermion Superconductivity: Ce115 and Related Materials". Journal of the Physical Society of Japan, 81, 011002 (2012). Abstract. Brian B. Zhou, Shashank Misra, Eduardo H. da Silva Neto, Pegor Aynajian, Ryan E. Baumbach, J. D. Thompson, Eric D. Bauer, Ali Yazdani. "Visualizing nodal heavy fermion superconductivity in CeCoIn5". Nature Physics, 9, 474-479 (2013). Abstract. M. P. Allan, F. Massee, D. K. Morr, J. Van Dyke, A. W. Rost, A. P. Mackenzie, C. Petrovic, J. C. Davis. "Imaging Cooper pairing of heavy fermions in CeCoIn5". Nature Physics, 9, 468-473 (2013). Abstract. K. Izawa, H. Yamaguchi, Yuji Matsuda, H. Shishido, R. Settai, and Y. Onuki. "Angular position of nodes in the superconducting gap of quasi-2D heavy-fermion superconductor CeCoIn5". Physical Review Letters, 87, 057002 (2001). Abstract. C. Stock, C. Broholm, J. Hudis, H. J. Kang, and C. Petrovic. "Spin Resonance in the d-Wave Superconductor CeCoIn5". Physical Review Letters, 100, 087001 (2008). Abstract. Stephan Haas, Kazumi Maki. "Quasiparticle bound states around impurities in dx2-y2-wave superconductors". Physical Review Letters, 85, 2172-2175 (2000). Abstract. A.V. Balatsky, I. Vekhter, J.X. Zhu. "Impurity-induced states in conventional and unconventional superconductors". Review of Modern Physics, 78, 373-433 (2006). Abstract.